Every year there are a a pair of rock and mineral shows in Arizona that are some of the largest in the world. They attract buyers and sellers literally from around the world! 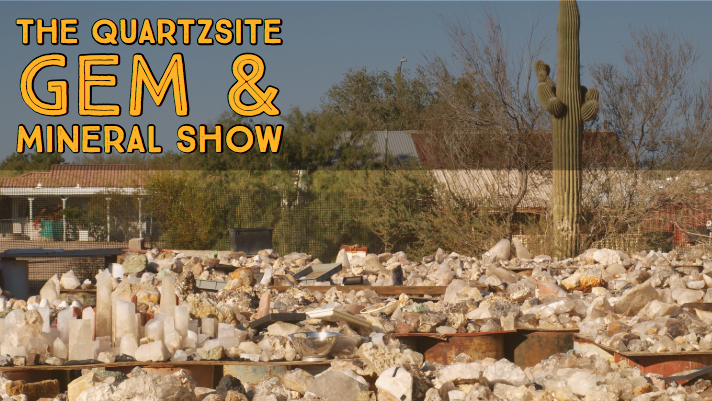 The most well-known show is in Tucson, and we will discuss it a little later, but first I want to talk about my personal favorite… the Desert Gardens Rock, Gem & Mineral Show in Quartzsite. If you are looking to add some rocks to your collection this is the place to be! The desert around Quartzsite has long been a mecca for winter travelers and RV’ers. The mild climate is a nice change from the long winters taking place throughout most of the country. The gem show runs through the entire months of January and February, but most of the activity takes places in the first couple weeks of January. If you come later in the show there will still be plenty of vendors and nice rocks to buy, but a lot of the dealers have packed up and moved to Tucson by the time February rolls around. It’s best to go prepared and have an idea of where all the shows are that you want to visit and where they are. During the winter there is all sorts of activity in Quartzsite, and this little desert towns can get downright congested! There are tents and vendors all over the places, but a lot of them are just general swap meets instead of rocks. There is no shortage of “junk” to buy, but if you are on the hunt for rocks and crystals then you want to make sure you are at the right sales. This is one of the largest gems shows in entire world. It is not an exaggeration to say that people visit from around the world. This past winter I met vendors from Morocco, India, Mexico, Mali, and Afghanistan. I’m sure there are dozens of other countries represented. It’s no surprise that you can find just about anything you are looking for. There will be tables full of $1 crystals, and high-end vendors selling individual pieces for thousands of dollars. Most of the vendors fall somewhere in the middle. Many of them specialize in a few different types of rock from their home area. There are several Moroccan vendors that have very similar types of material including lots of interesting fossils like ammonite and trilobites. There was a guy from Michigan that was just selling native copper specimens that he finds metal detecting throughout the summer. Each vendor is a little different. 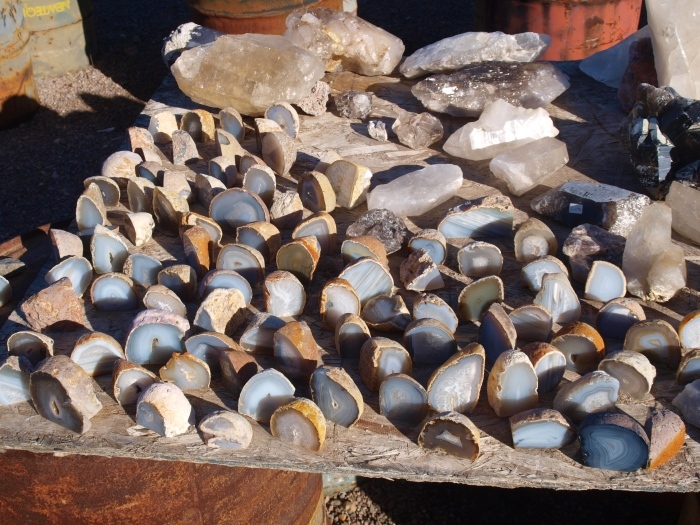 There are a lot of lapidary artists in Quartzsite, and you can buy some nice cabochons and jewelry making components if that is your interest. 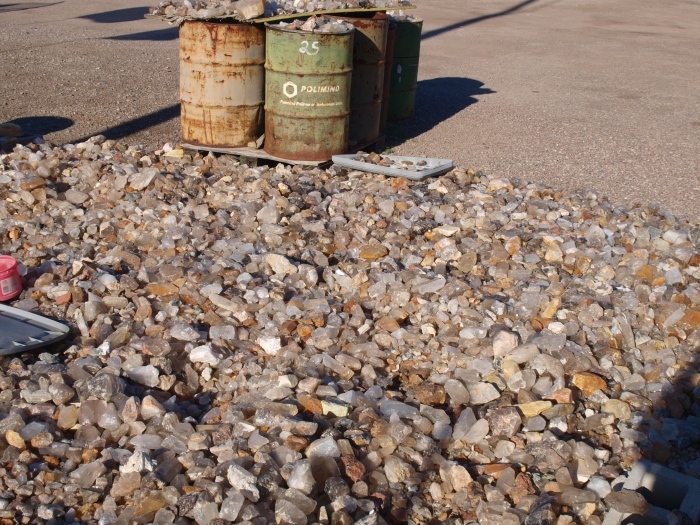 If you like rock tumbling there is a lot of nice bulk material that is reasonably priced too. One thing I like about the Quartzsite gems show is that anyone can find pieces that are affordable to add to their collection. If you only have a $20 bill in your pocket, you can leave with some fun and original crystals to add to your collection. 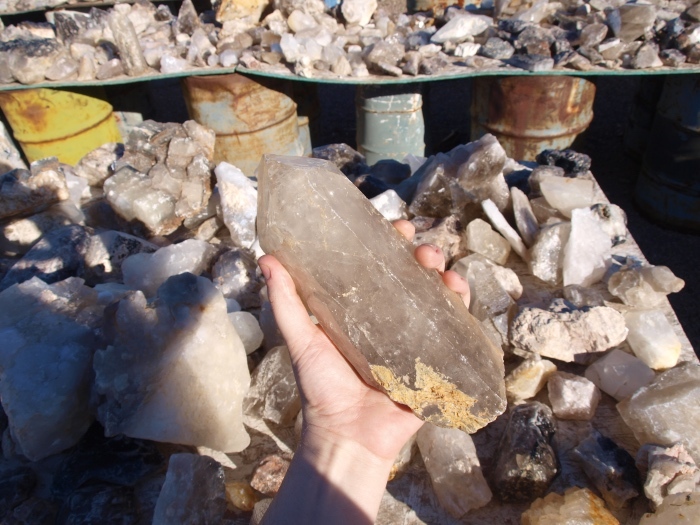 And it isn’t just collectors who come to Quartzsite looking for rocks. This is one of the biggest wholesale events in the country. Rock shop owners from throughout the USA come to Quartzsite to replenish their inventory. If you are buying in quantity you can get some spectacular deals from the dealers here. Let them know that you want to buy in bulk and watch the prices drop! In some ways, the Quartzsite and Tucson gems shows are very similar. At both shows you can find dealers from around the world selling a huge variety of rocks, minerals and fossils. If you love this kind of stuff, then both places will be like paradise for you. The Tucson shows are different in one very specific way… and that is the high-end material. The thing that makes the Tucson show famous is the truly world-class gems that go on display each year. Spectacular crystals that are truly the best in the world are on display here. I’m talking about stuff selling for over $100,000! You can also find some lower-end dealers in Tucson, but you have to know where to look. There are vendors scattered all throughout the city. If you are looking for cheaper material and better deals, you will have more luck at some of the “fringe” shows on the outskirts of town rather than at the main show. If you are truly looking for deals though, I recommend Quartzsite. Even when you find the right dealers in Tucson, you have to keep in mind that their overhead is higher. The prices are just higher in Tucson. If you are looking for a steal-of-a-deal, then hit the Quartzsite show and be prepared to do a little haggling. Here’s a hint for those of you looking to get the absolute best deals. Look for dealers who are loading up to leave! They’ve been out there selling for weeks and months. I’ve found these guys will give you some killer deals because they are pretty much “checked out” and ready to leave. Some dealers also intentionally try to sell out of inventory at the end of each show. They lower their prices every day until the literally sell every rock and gem that they have. Their prices will eventually get low enough that another vendor will buy them out completely. If you time things just right, you can get some awesome deals! There are quite a few businesses in town that sell rocks and crystals all year ‘round. So even if you time your visit wrong and miss out on the winter shows you can still buy some good stuff in Quartzsite. You won’t get the best deals from these year round dealers, but if you are buying in bulk they can still have some pretty good prices. But if you want to have the true Quartzsite experience, I recommend you show up in the first two weeks of January.